I don’t like to think of tattoo as a trend, mostly because it just isn’t. It is without a doubt an art form, though unfortunately there are many people out there who treat it as a trend and regard it as nothing more than that. This annoys me, but perhaps what annoys me even more is when people use the exposure that tattoo can bring to suit their own pathetic desire for media attention and lie about their tattoos or the reasoning for getting the tattoos that they have. In the past couple of years, we’ve seen two different girls lie about their tattoos, resulting in media frenzies that built until finally, each girl came out and told the truth. Most recently was the Facebook profile photo tattoo girl, who claimed to have had the profile photos of all 152 of her Facebook friends tattooed on to her arm in a sleeve. The following day after posting a video on YouTube detailing the tattoo and the process, the girl came out an admitted that the entire thing had all been a hoax. 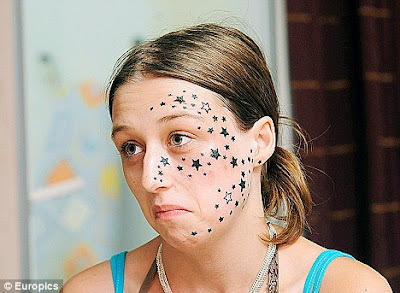 Two years ago, Belgian Kimberley Vlaminck accused her tattooist of tattooing 56 stars on her face as she slept. She claimed that she had only asked for three and the tattooist, Rouslan Toumaniantz, had misunderstood her. This also turned out to be untrue as Vlaminck later confessed to asking for all 56 stars, but lying about the entire incident after her father saw the tattoos. This sort of annoying, time wasting crap really gets under my skin. Aside from it being entirely idiotic to go online and lie about your tattoos, it also makes tattoos and tattooists appear frivolous, when in actuality it’s the people getting (or pretending to get) the tattoos who are the foolish ones. Well, in the case of Belgian Kimberley Vlaminck, there is at least a little bit of justice. Vlaminck is to now have her 56 star tattoo removed, a process that will cost her £9,000 ($14,571 USD). I don’t like being happy over other people’s misfortunes, but Vlaminck brough this entirely on herself and she completely deserves it. Not only that, but her face is no doubt going to suffer scarring from this procedure. I guess that’s what you get when you deceive the world and almost completely ruin the career of a tattooist. Too bad for her.